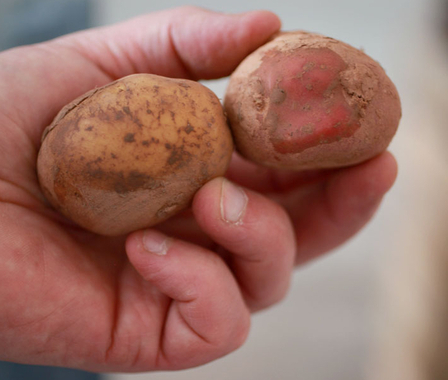 Pronounced 'puh-cheen', this spirit has been produced in Ireland since the 1600s, when potatoes were first harvested. Sometimes known as 'Irish Moonshine' or 'Mountain Dew', the original Gaelic name Poitín is a diminutive of the Irish word 'pota', meaning 'little pot', highlighting the small-scale production in pot stills. 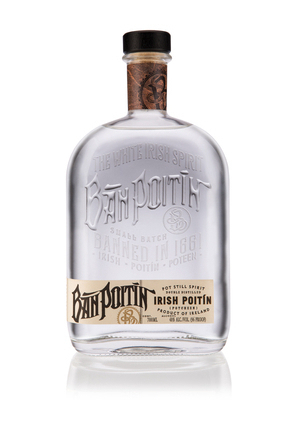 Poitín has been anglicised to also be spelt poteen. 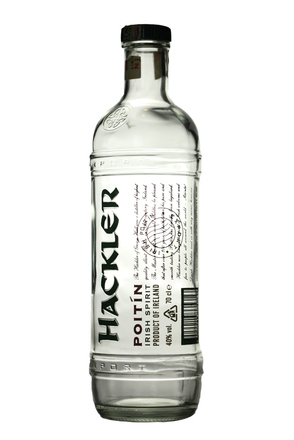 Basically a type of vodka, poteen's taste (both legal and illicit) tends to have a grainy flavour with hints of toffee and is often oily. Poorly made poteen can taste disgusting with high levels of volatile alcohols such as methanol making it toxic to drink. The good stuff, illicitly distilled from potatoes, is considered practically holy water by many traditionalists in Ireland. Over the past few centuries, Irish poteen has been used for many things besides being a libation. Traditionally it is taken for a range of medical problems, most notably impotence, rheumatism and arthritis - both in animals and humans. It is also used in baking cakes and pepping up racehorses and greyhounds before a big race. In 1661, the English king Charles II, attempting to rebuild his post-war treasury, introduced a charge on spirits in Ireland. Private distillation not licensed by the state was outlawed, meaning that a large portion of the nation who had been quite happily producing their own poteen became criminals overnight. Poteen was not legally produced until 1987, when Oliver Dillon of Bunratty Winery, County Clare, was granted permission to distil and bottle the spirit by Irish Revenue Commissioners, on the condition that he exported the spirit and did not sell it in Ireland. (Look out for his Potcheen brand, the first legalised poteen). On 7th March 1997, the Irish Revenue Commissioners withdrew their opposition to poteen sales in Ireland and legitimate brands became available on the Irish market for the first time. Regulation (EC) No. 110/2008 of The European Parliament And Of The Council of 15 January 2008 lists "Irish Poteen/Irish Poitín" under Annex III as one of the alcoholic beverages produced in the EU with (GI) Geographical Indicative status. However, the regulation does not give any definition or description for poteen. Although the heyday of home poteen distillation is long gone, there could well be as many as 50 illegal poteen distillers (or moonshiners) in Ireland. As is the way in Ireland, and anyone with Irish relations will testify, if you want to buy poteen, someone will know someone who knows someone else who frequents a certain pub. Traditionally, the Garda (Irish police) who pursue illicit distillers received an extra clothing allowance, known as the 'Britches Allowance', for the damage sustained while chasing moonshiners up hills and through undergrowth. Sadly the romantic image of a moonshiner sat on a remote hillside tending his still and then selling the few bottles produced down the pub has been superseded by criminal gangs operating large illicit distilleries and labelling their output as counterfeit vodka. Traditionally poteen is made from milk whey or potatoes, but it can also be produced from grain sugar beet and fruit (particularly apples). The base ingredients are fermented, traditionally in wooden barrels for about three weeks, to produce a 'beer'. This beer is then distilled, often in a homemade still, to produce a clear spirit. Illicit poteen tends to be bottled at the strength it comes off the still, so although it is not likely to have the alcohol content marked on the container, usually a reused bottle, expect it to be in the mid- to high-60s% alcohol by volume. To roughly estimate the strength of 'real' poteen, shake the bottle - if the liquid produces a foamy head which lingers then it is over 50% alcohol by volume. The larger and the longer the foam lasts, the more alcoholic the poteen. If your poteen burns with a red flame this indicates the presence of toxic methanol (ethanol burns with a blue flame). Poteen mixes well with orange juice, lemonade, cola, ginger ale, bitter lemon or tonic water. It can also make an interesting cocktail base. Poteen cocktail recipes here on Difford's Guide.